Take a long look at the current NFL draft order, because it’s not going to remain for long. We are officially three weeks away from the first day of the 2019 NFL Draft, starting on Thursday, Apr. 25. For the past three-plus months, 49ers fans have eagerly anticipated the team’s pick at No. 2 overall. Is it Nick Bosa or Quinnen Williams? Will the team surprise us and select Josh Allen or Ed Oliver? One thing is certain: the 49ers will receive calls from quarterback-needy teams coveting the No. 2 overall pick. This was never considered a top-tier quarterback draft class, contrary to last year’s, but teams always fall in love with quarterback prospects more and more as the draft nears. If recent years indicate anything, the 49ers will have options to trade down. In 2018, there were seven trades on the first day of the draft. There were six in 2017 and five in 2016. Last year, the New York Jets traded the No. 3 pick to the Colts for the No. 6 pick and three second-round picks, two in 2018 and one in 2019. The Colts ultimately drafted two first-team All-Pros with those picks, Quenton Nelson at No. 6 overall and Darius Leonard at No. 36 overall. This is the best example of a team (the Jets) doing whatever it takes to draft its franchise quarterback, and another team (the Colts) cashing in on those picks. Two years ago, the 49ers gave up the No. 2 overall pick to the Chicago Bears for the No. 3 overall pick, a third rounder, a fourth rounder, and a 2018 third-rounder. The Bears ultimately drafted quarterback Mitchell Trubisky, who would have likely dropped to them had they held onto their No. 3 pick. The 49ers roster is in a much better place than it was in 2017. Last month, Lynch said the 49ers will take the best player available, “regardless of position.” This draft is deep, and the 49ers could find excellent talent later in the first round and beyond. So, while all of this Bosa-Williams speculation has filled the draft season, it may not really apply if a team offers an enticing deal in exchange for San Francisco’s No. 2 pick. It’s impossible to predict which teams will contact the 49ers and how much they are willing to give up. But drawing from past scenarios, here are a few possible trades with San Francisco’s No. 2 overall pick. Lynch recently said 49ers couldn’t solidify a deal for Odell Beckham Jr. because the No. 2 overall pick was too valuable. Only a massive offer — similar to Chicago’s two years ago — will sway the 49ers to part with the pick. Teams know the 49ers won’t take a quarterback. Trading for the No. 2 pick is simply to jump the other quarterback-needy teams, which could turn into a bidding war. Two teams picking ahead of the Giants, the Raiders and Buccaneers, could potentially pick quarterbacks. Both teams have relatively young signal-callers in Derek Carr and Jameis Winston trending in the wrong direction. If the Giants feel either team will take a quarterback at No. 4 or No. 5 overall, they could leapfrog them by trading with the 49ers. In the above trade scenario, the 49ers get a haul. At No. 6 overall, they could potentially draft Oliver, whose testing numbers are nearly identical to Aaron Donald’s, or another edge rusher, whether Brian Burns, Montez Sweat, or Clelin Ferrell. This is all about how big the 49ers feel the dropoff is between Bosa and Williams with the next crop of standout defensive linemen. The 49ers already have the No. 36 pick. In this scenario, they would have back-to-back selections with New York’s No. 37 pick. Adding a 2020 second-rounder may be enough for the 49ers to accept. Let’s say Jon Gruden falls in love with a quarterback prospect, which he is known to do, and the Raiders trade up to the No. 2 pick. Remember, Oakland has all sorts of draft picks from dealing Khalil Mack and Amari Cooper. So, trading those assets could offset the logic to deal those playmakers, but again, Gruden loves his quarterbacks. The Raiders also have the No. 24, No. 27, and No. 35 picks in this month’s draft. Let’s say they deal the No. 27 overall pick. They would still have two more high picks, to go along with the No. 2 pick used to acquire their franchise quarterback. That’s a nice haul. From the 49ers’ side, they could potentially still draft their top overall player by moving back two spots. They aren’t going to take a quarterback, which means their top player won’t be gone after the first two picks if they trade the No. 2 pick to the Raiders. The Jets will take a position player with the No. 3 pick, who could be either Bosa, Williams, or Allen. The 49ers would still walk away with an instant difference-maker. The Broncos traded for Joe Flacco in February, but they are likely to add a quarterback to either compete for the starting job immediately or learn the ropes for a year. In this scenario, the Broncos would surrender their top-three picks in 2019, along with their 2020 second-rounder for San Francisco’s No. 2 pick. The Broncos have long been rumored to have interest in Missouri’s Drew Lock. There’s a chance he falls to the No. 10 spot, but he helped himself at the Combine, during interviews and workouts. If the Broncos like him enough, it’s possible they trade up to ensure they get him. 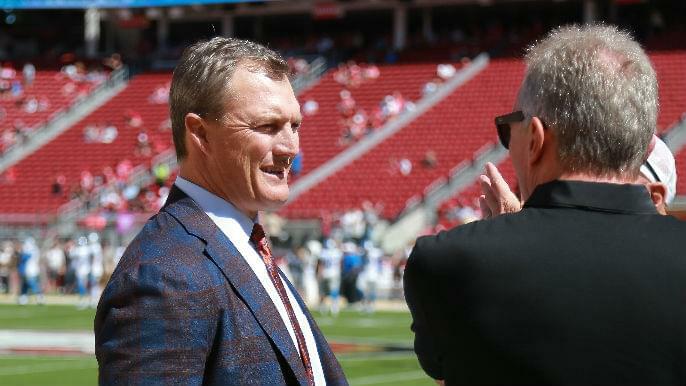 The 49ers likely won’t want to trade down much farther than the No. 10 spot. They would probably lose out on Oliver and Sweat here. Ferrell and Burns could be available. Or the 49ers could surprise everyone and take their top overall receiver. Let’s have a little fun with it. These are two unlikely scenarios featuring known players in the package. Green has been subjected to trade rumors of seemingly little merit. The seven-time Pro Bowl receiver has said he would like to play with the same organization his entire career. Bengals owner Mike Brown has stated his desire to keep Green in Cincinnati for a long time. Green enters the final year of his contract in 2019. He has been exceptional from Year 1 through Year 8, averaging 80.6 receiving yards per game, the fifth-best mark in NFL history. But he has recently battled injury issues: he missed seven games in 2018 and six in 2016. He will turn 31 before the start of the 2019 season. In this trade scenario, the teams simply swap first-round picks, and the 49ers acquire one of the best receivers of the past decade. In this trade, the 49ers would acquire one pick higher than the Cincinnati one, the No. 41 overall pick, and Sanders, another proven receiver. Sanders is in a similar place as Green: he is 32 years old, coming off an Achilles tear in December, and enters the final year of his deal. The Broncos likely want to hold onto Sanders after trading Demaryius Thomas last year. But the team could choose to continue stocking its receiving corps with young talent after drafting Courtland Sutton in the second round last year.